As the next series of RS-25 engine test firings at the Stennis Space Center in Mississippi nears, prime contractor Aerojet Rocketdyne is assembling the new components to complete testing and certification of its “production restart” design and fabricating the parts for new flight engines. Aerojet Rocketdyne’s RS-25 program is primarily based out of its Canoga Park facility in the Los Angeles area, where most of the engineering and production of the engines is done. Long-lead items for the six flight engines in the contract are already being fabricated and by the time the first new “certification engine” is fully assembled, the first of those flight engines will be lined up behind it. All of the flight engines are planned to be delivered to NASA by July, 2024; the new engines are due to begin flying on the fifth Space Launch System (SLS) launch. The SLS Program has sixteen engines left over from the Space Shuttle era, which will be used on the first four launches. Formerly known as the Space Shuttle Main Engine (SSME), SLS will fly four RS-25 engines at a time instead of the three in Shuttle, operate them at higher power levels and pressures and lower temperatures, and in a more severe thermal environment. Although the SLS operating environment was outside of its flight experience, the existing engine design and hardware — referred to as “adaptation” engines — was certified to fly on SLS with relatively few modifications through extensive ground testing from early 2015 through late 2017. The adaptation engines are being flown one last time with the expendable SLS design, and going forward changes to the engine design for new units are being made to requirements for an expendable vehicle. Beginning in December, 2017, the focus of testing shifted to development and certification of the “production restart” design. Aerojet Rocketdyne (AR) was awarded a contract by NASA in late 2015 to restart production of the RS-25. Development engine 0525 during lift operations in the A-1 test stand at Stennis Space Center, 23 July 2018. Credit: NASA Stennis. “The development and certification series that we’re in the midst of now and that will conclude with a design certification review (DCR) in the December 2021 time-frame, that will now baseline and certify the engine,” Adamski added. 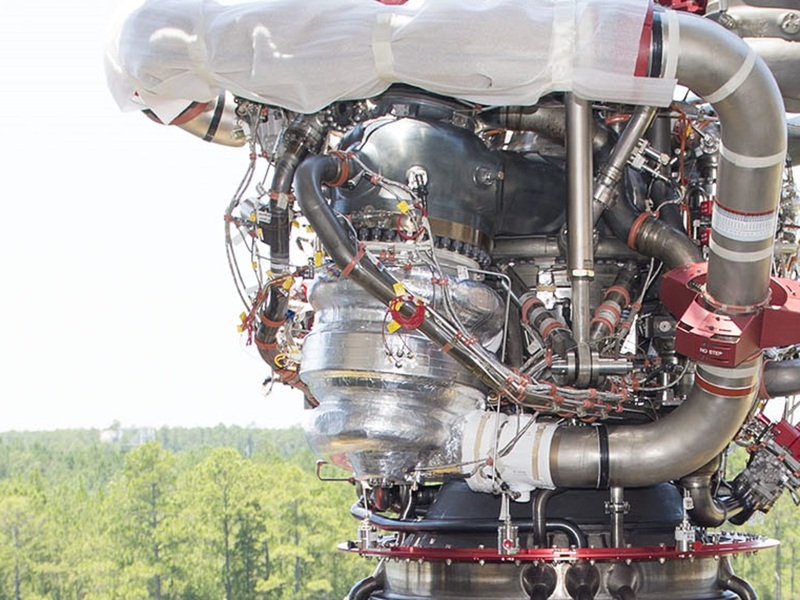 New builds of the RS-25 engine, which burn liquid hydrogen and liquid oxygen, will be flown at a higher power level than will be used for the first SLS launches, 111 percent of the original SSME “rated power level” (RPL) of 375,000 pounds of thrust at sea level, 470,000 pounds thrust at vacuum. The first four launches with the adaptation engines will typically fly at 109 percent RPL. 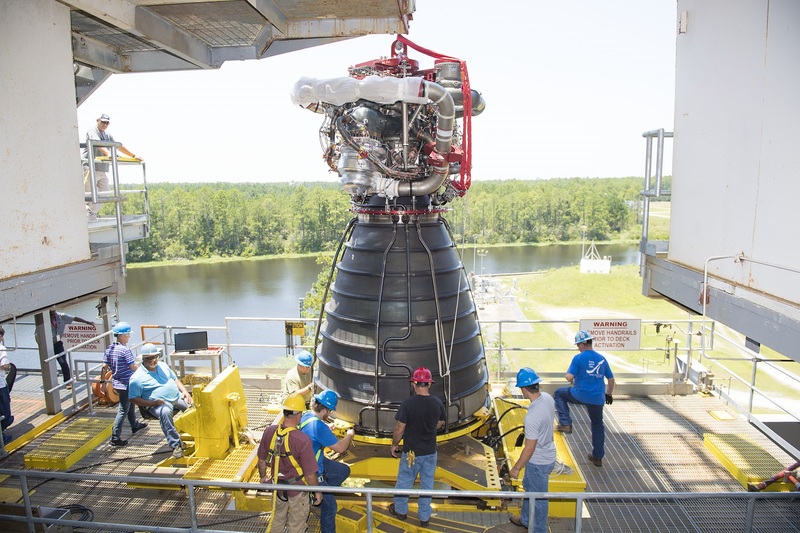 Changes to the engine design will be certified in part during dozens of ground test firings at Stennis, grouped into a series of tests on different ground test engines. The first production restart test series, called “Retrofit 1a”, was completed in late February. That series demonstrated the first major production restart component, the pogo accumulator assembly. The pogo units are now built using “selective laser melting” (SLM), an additive manufacturing (also known as “3-D printing”) technique. The last of four hot-fire tests saw development engine 0528 (E0528) throttled up to a record 113 percent RPL. The upcoming Retrofit 1b test series is currently targeted to start in the A-1 test stand at Stennis around August 14th. 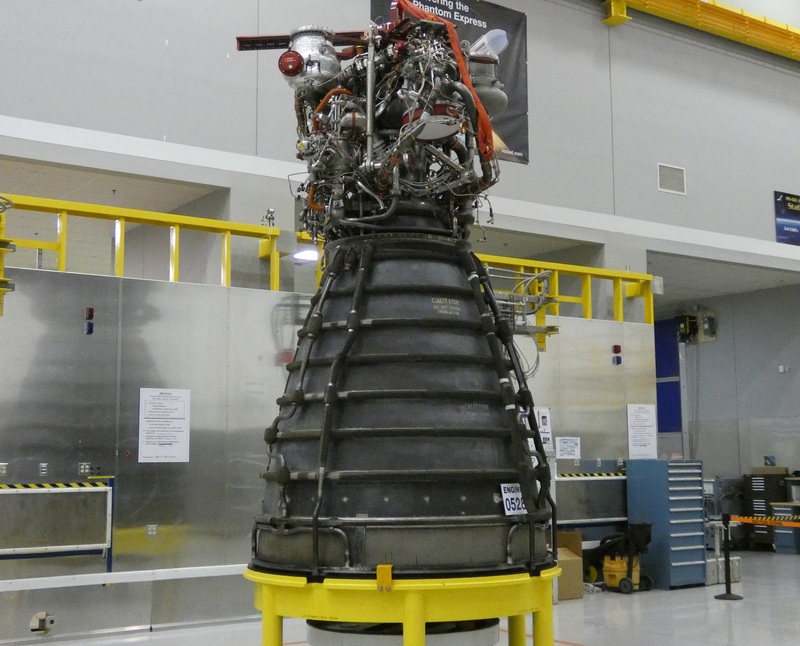 Following the completion of the rapid-turnaround demonstration of the AR-22 engine, Aerojet Rocketdyne’s other SSME derivative, E0525 was delivered to the stand on July 23 for installation. The silver-colored insulation surrounding the high-pressure fuel turbopump (lower center of image) is a more affordable system brought to the RS-25 from Aerojet Rocketdyne’s RS-68 program. The insulation will see its first RS-25 service on the Retrofit 1b series. Credit: NASA Stennis. 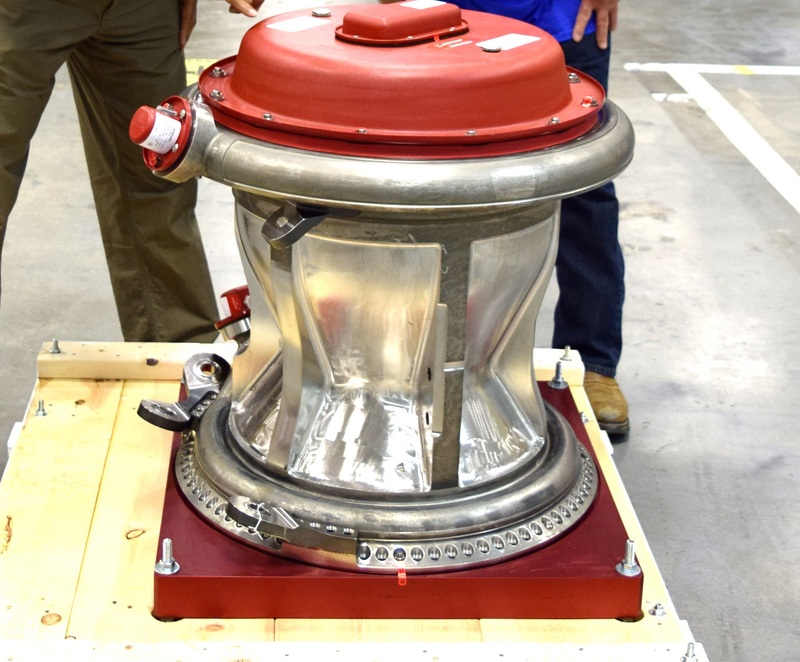 The first test is planned for a nominal flight duration and a standard throttle profile, as would be seen in an engine acceptance test or “green run.” There are nine total tests planned in the Retrofit 1b series, which will test the new “hot-isostatic press” (HIP) bonded main combustion chamber (MCC) and a new insulation system for the high-pressure fuel turbopump (HPFTP), along with the SLM pogo accumulator first tested in Retrofit 1a. Following the Retrofit 1b series using E0525, E0528 will go back in the A-1 test stand for the Retrofit 2 series. “[The] big thing on that series is we’re planning to get the flex-hoses on the ducts,” Adamski noted. Partially disassembled E0528 at Stennis, 2 July 2018. A more significant disassembly will occur to allow a new MCC to be installed on the engine to support the future Retrofit 2 series. Credit: Philip Sloss for NSF/L2. During the maintenance period earlier this year, the A-1 test stand was outfitted with a new thrust vector control (TVC) system that will see use during Retrofit 2. The series is planned to include twelve hot-fire tests, and the flex-hoses and the ground TVC system will be exercised as gimbaling is introduced into some of the test firings. E0528 will be outfitted with a larger set of new hardware, including new units of all the components being demonstrated in the first two retrofit series along with the new flex hoses. “So it will be the second MCC, it will also be the second pogo,” Adamski said. Retrofit 2 will also include the first new low-pressure fuel turbopump. Retrofit 3 with E0525 will then follow. The major new hardware component to be added to the production restart hardware set is the engine nozzle. “That’s one of the big things on Retrofit 3,” Adamski said. A shot of the new four-piece nozzle jacket for the RS-25. The old jacket was assembled from 37 pieces. Credit: NASA. 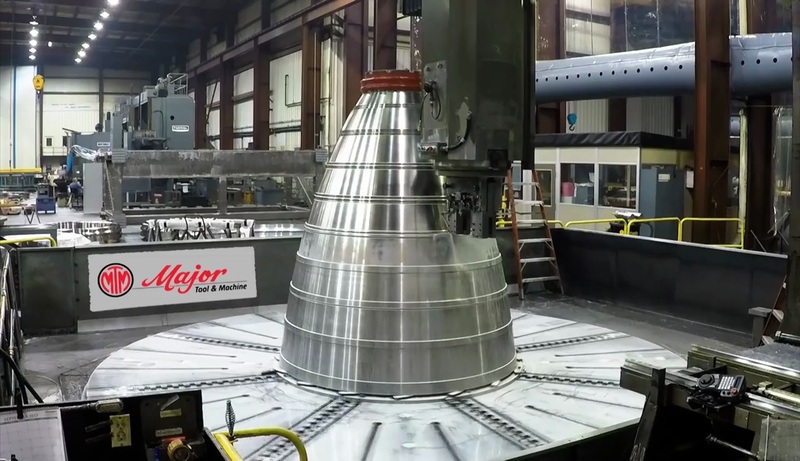 The nozzle jacket is now being assembled from four pieces, as opposed to the thirty-seven it took for SSMEs; at the time of the interview, Canoga Park was in the process of building up the fourth nozzle jacket that will be a part of the second flight engine in the production line, following ones for Retrofit 3, the certification engine, and the first new flight engine. After the four pieces are welded together, over one-thousand cooling tubes will be added to the inside of the jacket. Another element added at the bottom of the nozzle is the aft manifold that helps to distribute a branch of the hydrogen flowing through the engine while it is running to the nozzle cooling tubes before it is circulated back for combustion. The aft manifold had one of the more complicated manufacturing processes during the Shuttle era, moving into and out of six different machine areas in the shop. A single machine now does all of those tasks without requiring the assembly to be moved, eliminating several intermediate handling operations. Turn of the century diagrams showing the shape and location of the “hot dog” (highlighted in the green boxes). Credit: Boeing Rocketdyne Propulsion and Power, which subsequently merged to become Pratt & Whitney Rocketdyne, and then merged again to become Aerojet Rocketdyne. Canoga Park is currently manufacturing the second aft manifold unit, which will go on the certification engine. Another example of affordability improvements is with the “liquid oxygen tee manifold.” Nicknamed the “hot dog” due to its basic shape, the complicated geometry of the part used to be assembled from thirteen separate pieces for SSME; the new design is a single piece machined from a near net shaped forging. The development phase of the production restart program will culminate in production and assembly of the first complete new engine. AR is calling the first full, new build a “certification engine.” “The certification engine will be pretty much a flight engine configuration,” Adamski said. By the time all the parts for the certification engine are manufactured, all the elements of the production line and supply chain will be online and working on the six flight engines that are the final deliverables in the production restart contract. First production restart main combustion chamber (MCC) in April. Now installed on E0525, the HIP-bonded MCC is the centerpiece of the Retrofit 1b test series that begins next month. Credit: Aerojet Rocketdyne. A majority of the RS-25 program is based at the Canoga Park facility. “[The] center of the program is here, most of the design center is here, [the] shop/strategic fabrication center (all the in-house machining), [and] component testing,” Adamski said. 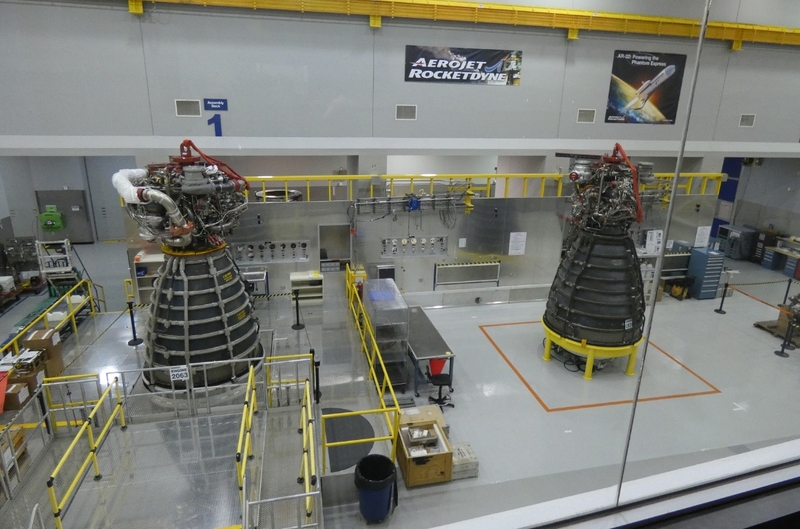 Most of the work is done in-house, but Kevin Cramer, RS-25 Deputy Program Director for Aerojet Rocketdyne noted that they do get basic materials from the outside. “We get our liners [and] we get raw material from suppliers,” he explained. High-pressure turbopump assembly is done at AR’s facility in West Palm Beach, Florida, and low-pressure turbopump assembly is done at their Stennis facility. All of the components and the new engine controller units (ECU) built by Honeywell go to Stennis when they are complete for final assembly and acceptance testing. The bottom of E2063’s nozzle at Stennis, 2 July 2018. Several components have nicknames, such as one of the “steerhorns” seen below and to the left of the placard. The two branches feed into the ring at the bottom, the aft manifold. The other horizontal rings are known as “hatbands.” Credit: Philip Sloss for NSF/L2. Canoga Park is already fabricating parts for the certification engine and long-lead hardware for the flight engines that will follow the certification engine to Stennis for final assembly and acceptance testing for eventual flight. “Flight engines are being built right now,” Adamski noted. In addition to the production lines for components like the pogo accumulators, MCCs, and nozzles, work to build other major components is ramping up. Along with downstream units for the second flight engine, such as the nozzle jacket and aft manifold, Canoga Park was also working on the main injector for that engine. Other elements of the certification engine powerhead are also being fabricated. As the design is being certified through ground testing, work will be continuing to complete production and delivery of the flight engines. “We get to a final certification engine, I believe it’s in the early to mid-2021 time-frame and then the six production engines will follow right behind that,” Adamski said. NASA began the procurement process for production of subsequent Core Stage Engines (CSE) with a “sources sought request for information (RFI)” earlier this year. As expected, NASA announced this week that the RS-25 is the only engine that can meet the stated requirements and will negotiate with AR for the 18-engine contract. 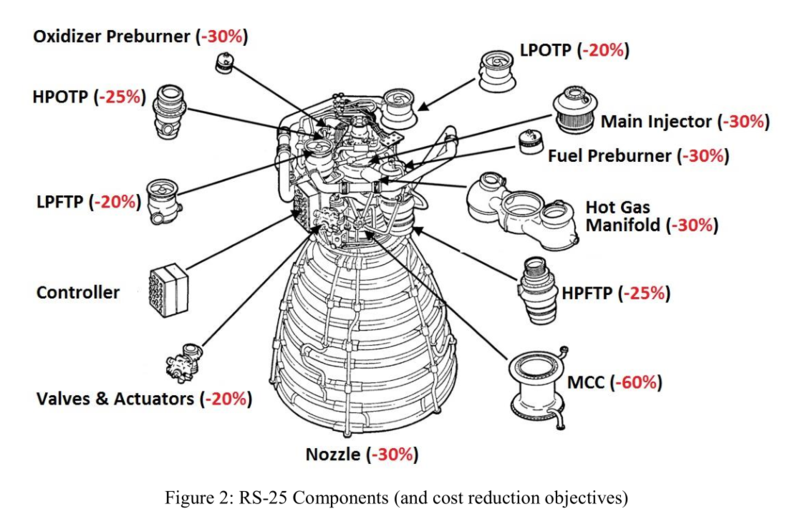 RS-25 production restart goals from a 2017 NASA presentation. Credit: NASA. 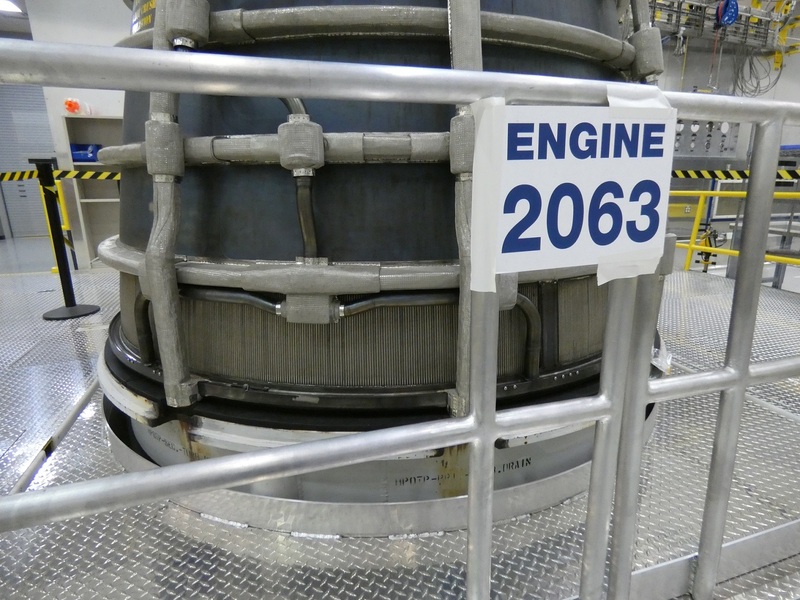 The July, 2025, first-set delivery date requirement in the RFI lines up behind the July, 2024 date by which time all six of the production restart flight engines should be delivered to NASA. The production restart contract established a production rate of two engines per year, so the new contract would double that rate to meet the desired rate of one SLS flight per year. In addition, the recent down-payment and direction by Washington to construct a second Mobile Launcher allows NASA to potentially fly the SLS Block 1 configuration more frequently in the early 2020s, which could consume the existing adaptation engine inventory a little faster; however, Adamski said AR has not seen changes to downstream flights.